Bu çalışma yabancı dil öğretiminde sosyal medya kullanımının memnuniyet ve başarı üzerine etkisini ortaya koymak amacıyla yapılmıştır. İngilizce derslerinde Facebook sosyal medya aracı olarak kullanılmış ve 8. sınıf öğrencileri çalışmaya katılmıştır. Deney grubu yabancı dil derslerinde sosyal medyayı kullanırken kontrol grubu teknoloji destekli yabancı dil eğitimini sürdürmüştür. Bu çalışmada teknoloji destekli yabancı dil eğitimi öğrenme yönetim sistemlerini ve yüz yüze eğitimi destekleyen teknolojik araçları içermektedir. Karmaışık araştırma deseni kullanılmıştır. Nicel kısım için veriler memnuniyet anketi ve başarı testi ile toplanmıştır. Nitel kısım için yarı yapılandırılmış görüşme ile yüz yüze görüşme tekniğinden yararlanılmıştır. Nicel veriler Kolmogorov-Smirnov testi, bağımsız örneklem t-testi ve ANCOVA kullanılarak analiz edilmiştir. Bilgi oluşturma modelinin de dikkate alındığı nitel kısım için içerik analizi kullanılmıştır. Deney grubunda derslerini Facebook ile alan öğrencilerin yabancı dil derslerinde daha yüksek sosyal farkındalık düzeylerine sahip oldukları sonucuna varılmıştır. This study was carried out in order to reveal the effects of using social media on social presence in foreign language teaching. Facebook was used as a social media tool as part of the English lessons and 8th grade students who attended a private school in Istanbul participated in the study. The students in the experimental group used social media for their foreign language classes and the control group continued their technology supported foreign language education. Technology supported foreign language education was considered to be the education that involved learning management systems and technological tools that support face-to-face education. Mixed research design was used. For the quantitative part, data were collected with the social presence scale and for the qualitative part face-to-face interview with semi-structured interview technique took place. The quantitative data were analyzed by using Kolmogorov-Smirnov test, independent samples t-test and ANCOVA. For the qualitative part content analysis was used where knowledge building model was also considered. Based on the findings, it was concluded that students in the experimental group who had their classes with Facebook had higher social presence in their foreign language lessons. Akbari, E; Naderi, A.; Jan-Simons, R. & Pilot, A. (2016). Student engagement and foreign language learning through online social networks. Asian-Pacific Journal of Second and Foreign Language Education.1:4 1-22. Akgündüz, D. (2013). Fen eğitiminde harmanlanmış öğrenme ve sosyal medya destekli öğrenmenin öğrencilerin başarı, motivasyon,tutum ve kendi kendine öğrenme becerilerine etkisi. Marmara Üniversitesi, Eğitim Bilimleri Enstitüsü, İlköğretim ana bilim dalı, Fen Bilgisi öğretmenliği dalı. Unpublished PhD dissertation. Arbaugh, J.B., Cleveland-Innes, M., Diaz, S.R., Garrison, D.R., Ice, P., Richardson, J.C., ve Swan, K.P. (2008). Developing a community of inquiry instrument: Testing a measure of the Community of Inquiry framework using a multi-institutional sample. The Internet and Higher Education. 11 (3-4), 133-136. Blake, R.. (2008) Brave new digital classroom: Technology and foreign language learning. Washington; D.C: Georgetown University Press. Blattner, G., & Fiori, M. (2009). Facebook in the language classroom: Promises and possibilities. Instructional Technology and Distance Learning (ITDL), 6(1), 17-28. Borup, J., West, R., & Graham, C. (2011). Improving online social presence through asynchronous video. Internet and Higher Education, 15, 195-203. Bosch, T. E. (2009). Using online social networking for teaching and learning: Facebook use at The University of Cape Town. Communicatio, 35 (2), 185200. Boston, W., Díaz, S. R., Gibson, A. M., Ice, P., Richardson, J., & Swan, K. (2009). An exploration of the relationship between indicators of the Community of Inquiry framework and retention in online programs. Journal of Asynchronous Learning Networks, 13(3). Brick, B. (2011a). How effective are web 2.0 language learning sites in facilitating language learning? Compass: The Journal of Learning and Teaching at the University of Greenwich, 3, 57-63. Büyüköztürk, Ş. (2006). Sosyal bilimler için veri analizi el kitabı. Ankara: Pegem-A Yayıncılık. Cazden, C. (1986). “Classroom discourse”. In Handbook of research on teaching, 3rd ed., Edited by: Wittrock, M.C. 432-463. New York: Mac Millan. Cross, J. (2006). Foreword. In Bonk, Curtis J. & Graham, Charles R. The Handbook of blended learning: Global perspectives, Local designs. San Francisco, CA: Pfeiffer. Edirisingha, P, Rizzi, C, Nie, M, & Rothwell, L (2007). Podcasting to provide teaching and learning support for an undergraduate module on English language and communication. Turkish Online Journal of Distance Education, 8(3), 87–107. Ellison, N. B. (2008). Introduction: Reshaping campus communication and community through social network sites. In G. Salaway, J. B. Caruso, & M. R. Nelson, The ECAR Study of Undergraduate Students and Information Technology, (Research Study, Vol. 8). Garrison, D. R. & Arbaugh, J.B. (2007). Researching the community of Inquiry Framework: Review, Issues, and Future Directions. The Internet and Higher Education, 10(3), 157-172. Garrison, D. R. (2011). E-learning in the 21st century: a framework for research and practice (2nd ed.. ed.). New York: New York: Routledge. Hackman, M. Z., & Walker, K. B. (1990). Instructional communication in the televised classroom: The effects of system design and teacher immediacy on student learning and satisfaction. Communication Education, 39(3), 196-206. Herrenkohl, L. R. & Guerra, M. R.1998. Participant structures, scientific discourse, and student engagement in fourth grade. Cognition and Instruction., 16: 431–473. Hodges, H. F. (2011). Preparing new nurses with complex science and problem-based learning. Journal of Nursing Education, 50(1), 7-12. Hollis, H. (2014). The impact of social media on social presence and student satisfaction in nursing education. The dissertation The University of Alabama. Hostetter, C., & Busch, M. (2006). Measuring up online: The relationship between social presence and student learning satisfaction. Journal of Scholarship of Teaching and Learning, 6(2), 1-12. Kalafat, Ö. ve Göktaş, Y. (2011). Sosyal ağların yükseköğretimde kullanımı: Gümüşhane Üniversitesi, Facebook örneği.5th International Computer & Instructional Technologies Symposium, Fırat University, Elazığ- Turkey. Karlin, S. (2007). Examining how youths interact online. School Board News, 73(4), 6-9. Ke, F. (2010). Examining online teaching, cognitive, and social presence for adult students. Computers & Education, 55(2), 808-820. Keleş, E. & Demirel, P. (2011). Bir sosyal ağ olarak Facebook'un formal eğitimde kullanımı.5th International Computer & Instructional Technologies Symposium, 22-24 September 2011. Fırat University, Elazığ-Turkey. Kikuchi, K, & Otsuka, T (2008). Investigating the use of social networking services in Japanese EFL classrooms. The JALT CALL Journal, 4(1), 40–52. Kwon, O.& Wen,Y. (2010). An empirical study of the factors affecting social network service use. Computers in Human Behaviour 26 (2) 254-263. Retrieved from http://dl.acm.org/citation.cfm?id=1668148 on10.03.2016. Leh, A. S. C. (2001). Computer-mediated communication and social presence in a distance learning environment. International Journal of Educational Telecommunications, 7(2), 109-128. Lehman, R. M., & Conceição, S. C. O. (2010). Creating a sense of presence in online teaching: How to "Be there" for distance learners. San Francisco: Jossey-Bass. Lenhart, A., Purcell, K., & Smith, A. (2010). Social media and mobile internet use among teens and young adults. Pewinternet.org, Retrieved from http://web.pewinternet.org/~/media/Files/Reports/2010/PIP_Social_Media_and_Young_Adults_Report_Final_with_to plines.pdf. Linder, R., Post, G., & Calabrese, K. (2012). Professional learning communities: Practices for successful implementation. Delta Kappa Gamma Bulletin, 78(3), 13-22). Lowenthal, P. R., & Dunlap, J. C. (2011, April). Investigating students’ perceptions of various instructional strategies to establish social presence. Paper presented at the annual meeting of the American Educational Research Association, New Orleans, LA. Luke, L.L. (2006). Situating CALL in the broader methodological context of foreign language teaching and learning: Promises and possibilities, CALICO Monograph, 5, 21-41. Madge, C., Meek, J., Wellens, J.ve Hooley, T. (2009). Facebook, social integration and informal learning at University: 'It is more for socialising and talking to friends about work than for actually doing work'. Learning, Media and Technology. 34(2), 141-155. Marchand, G., & Gutierrez, A. (2011). The role of emotion in the learning process: Comparisons between online and face-to-face settings. Internet and Higher Education, 15, 150-160. Mason, R. ve Rennie, F. (2008). E-learning and social networking handbook: resources for higher education. New York: Routledge.Mayfield, A. (2010). What is Social Media, iCrossing, e‐book, s. 6. http://www.icrossing.co.uk/fileadmin/uploads/eBooks/What_is_Social_Media_iCrossing_ebook.pdf. Access date: 15.04.2016. Motteram, G, & Sharma, P (2009). Blending learning in a web 2.0 world. International Journal of Emerging Technologies and Society, 7(2), 83–96. National School Boards Association (2007). Creating and connecting: Research and guidelines on social and educational networking.www.nsba.org/SecondaryMenu/TLN/CreatingandConnecting.aspx. Access date: 15.08.2016. Özmen, F., Aküzüm, C., Sünkür, M. & Baysal, N. (2011). Sosyal ağ sitelerinin eğitsel ortamlardaki işlevselliği. 6th International Advanced Technologies Symposium (IATS’11), Elazığ, Turkey. Siemens, G.(2005a).Connectivism: A Learning Theory for the Digital Age. International Journal of Instructional Technology and Distance Learning, 2(1), 3-10. Silius, K., Miilumaki, T., Huhtamaki, J., Tebest, T., Merilainen, J. & Pohjolainen, S (2010). Students’ Motivations for Social Media Enhanced Studying and Learning. Knowledge Management & E-Learning: An International Journal, 2 (1), 51-67. Smith,F. (2009). How to use social-networking technology for learning. Access date 15. 11.2016 via http://www.edutopia.org/social-networking-how-to. Staples, D. S. (2009). Web 2.0 social networking sites. In M. Lytras, ve P. Ordóñez de Pablos (Eds. ), Social Web Evolution: Integrating Semantic Applications and Web 2.0 Technologies, 57-75. Hershey, PA: Information Science Reference. Tu, C.-H., & McIsaac, M. (2002). The relationship of social presence and interaction in online classes. The American Journal of Distance Education, 16(3), 131-150. Wang, H. (2010). Eight ways to increase social presence in your online classes. Retrieved from Faculty Focus website: http://www.facultyfocus.com/articles/onlineeducation/eight-ways-to-increase-social-presence-in-your-online-classes. Zhang, J., Scardamalia, S., Reeve, R., & Messina, R. (2009). Designs for Collective Cognitive Responsibility in Knowledge-Building Communities, Journal of the Learning Sciences (18), 7-44. ISNAD Ergün Elverici, Sibel , Karadeniz, Şirin . "THE EFFECTS OF SOCIAL MEDIA ON SOCIAL PRESENCE IN TEACHINGA FOREIGN LANGUAGE". 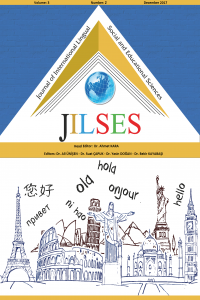 The Journal of International Lingual Social and Educational Sciences 4 / 2 (December 2019): 174-185.